The pre-eminent political and spiritual leader of India during the Indian independence movement, Mahatma Gandhi, who advocated resistance to tyranny through mass civil disobedience and total non-violence, is emulated by school children who believe his ideaologies lacked only violence. "He was an iron fist short of becoming a dominant world leader," a child spokesperson shown above said through an interpreter. 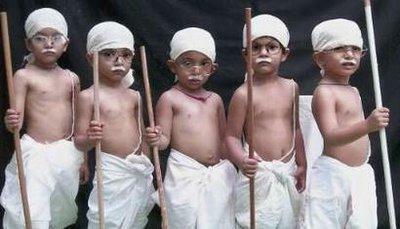 The children plan to use the sticks to attack small animals first, and then other children in order to "raise national consciousness regarding Gandhi's only inadequacy."